Here is a brief summary of conditional immortality. 1. ONLY GOD IS IMMORTAL BY NATURE. IMMORTALITY IS A GIFT OF GOD TO CREATURES. The Bible affirms that God alone has immortality as a present possession (1Tim. 1:17 c.f. 6:16). The “glory of the immortal God” is contrasted with that of “mortal man” (Rom. 1:23). For humanity, immortality is still a prize to be sought after (Rom. 2:7). It will be granted only to “those who are considered worthy” (Luke 20:34-36), to the believer in Christ alone, and then only when Jesus returns (1Cor. 15:42-54). 2. A “SOUL” IS SOMETHING WE ARE, NOT SOMETHING WE HAVE. Meanwhile, human beings are creatures of dust (Gen. 2:7 c.f. 3:19, 18:27; Ps. 103:14). We do not have souls, we are “living souls” (Gen. 2:7), as are the animals (Gen. 1:20, 21, 24, 30, 2:19). 3. SPIRIT IS THE PRINCIPLE OF LIFE GIVEN TO BOTH HUMANS AND ANIMALS BY GOD. The spirit of God inbreathed is what gives life; the outgoing of the spirit returning to God who gave it, is death for human and animal alike (Gen. 1:30, 6:17, 7:15, 22; Job 34:14-15; Psa. 104:29-30; Eccl. 3:18-21, 12:7). 4. IN DEATH ALL OF US DIES, NOT JUST PART OF US. 5.IN DEATH THERE IS NO CONSCIOUSNESS. In the state of death there is no remembering (Ps. 6:5); no praising (Ps. 6:5, 115:17, Is. 38:18); no thinking (Ps. 146:4, Eccl. 9:4); no hoping (Eccl. 9:4, Is. 38:18); only silence (Ps. 115:17). The dead, good and bad alike, are said to”asleep” (Dan. 12:1-2, 1Thess. 4:13-18). Wicked Jeroboam slept with his fathers (1Kgs 14:20), as did evil Ahab (1Kgs 22:40). Faithful Job expected to “sleep in the dust” (Job 7:21). Jesus’ friend Lazarus fell asleep (John 11:11) as did the martyr, Stephen (Acts 7:60). 6.THE ONLY HOPE OF THE DEAD IS PERSONAL RESURRECTION TO LIFE. The Bible puts forward no hope other than that of resurrection. Isaiah says, “Your dead will live; their bodies will rise. You who dwell in the dust; wake up and shout for joy.” (Is. 26:19). Daniel too makes this point: “Many who sleep in the dust of the earth shall awake” (Dan. 12:2). Paul too, puts forth the resurrection to eternal life as the only hope for the believer (1Cor. 15; 1Th. 4:13-18). 7.THE RESURRECTION OF THE UNSAVED WILL BE TO JUDGEMENT AND DESTRUCTION. “perish”; “be burned up” and “be no more”. They “will be ashes under the soles of your feet” (Mal. 4:1, 3). The “undying worm” and “unquenchable fire” consume their corpses (Is. 66:24 c.f. Mark 9:48). 8.THE NEW ORDER OF CREATION WILL CONTAIN NO REMNANT OF SIN OR WICKEDNESS. Ultimately, heaven and earth will be made new (Isa. 65:17, 66:22, Rom. 8:19-21, 2Pet. 3:13, Rev. 21 &22). “The earth will be filled with the glory of the Lord” (Num. 14:21, Isa. 11:9, Hab. 2:14) and “God will be all in all.” (1Cor. 15:28). There will be no corner of this universe where sinners exist forever in rebellion against him! Conditional Immortality takes Scripture at face value: life means life; death means death. This affects how we understand the atonement, sin and its penalty, human nature, death, resurrection, and life in immortality. It puts the hope of the Second Coming and the Kingdom of God into proper perspective: at centre stage. It makes Judgment Day, the climax of history. It affirms the reality of “hell” without impugning God’s character. It affirms God’s final victory over sin and evil. 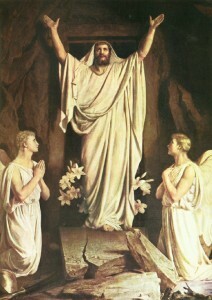 “Life Only In Christ” gives full honour to Christ as “the resurrection and the life” (John 11:25). I agree with your approach to the subject of hell and immortality. I like your statement that you take at face value life means life and death means death. “The wages of sin is death (not eternal torment), but the gift of God is eternal life.” Mine is a simple biblicism. Thank you for your bold stand for the truth. I know firsthand the kind of opposition you face. Let us carry on “the good fight” for the glory of our King and perfect Dad. It is His honor that is undermined by the doctrine of never-ending torture. He says He is perfect love. Mankind’s demonically-inspired theology defines that as keeping the lost alive indefinitely so they can suffer infinitely as punishment for a very short life-time of rebellion and confusion. For those who don’t know, the phrase “eternal punishment” is not the same as “eternal punishing”. The Greek phrasing is similar to eternal redemption, eternal judgment, eternal condemnation, etc. In other words, a one-time action that has eternal consequences. The final punishment is a death that is eternal and will never be changed, the “Second Death”, and God reveals Himself to be precisely fair/just as He has promised, “the soul that sins shall die” and “the wages of sin is death”. Only those who receive Christ have His Life which is the only unending life. Keep up the good work. I look forward to helping your efforts when i can. So true! Very concise and accurate. I like especially your conclusion “It puts the hope of the Second Coming and the Kingdom of God into proper perspective: at centre stage”. So much of Christianity is focused on ‘what can God do for me now’ we hear little about the Second Coming. Likewise, the contemporary perspective on death – souls going to heaven – robs the resurrection of it’s real power, and the kingdom of God into an internal concept rather than a future reality. The Bible, when read without traditional lenses, makes much more sense! Thank you for this overview put together succinctly and so clearly. These truths are what the Bible teaches when it is read without presupposition and traditional thinking clouding our minds. I never understood the subject of immortality until I began to study this subject years ago. It became clear to me a long time ago that what is being taught in most seminaries is what gets parroted into the churches, thus people stay in the dark on this subject and things related to it even indirectly. I am going to share this page as a starting point to talk with friends!